Cerriq-Gleision is considered the pinnacle of Maclure’s Chalet style, in this case based on British Arts & Crafts. He had designed other types of chalet houses, eg: 1023 St. Charles St in 1896 and 1009 Terrace Av in 1899-1900, both in Rockland. 1598 Rockland is 1½ storeys and cross-gabled, with a gabled extension on the left side, now enclosed, and a shed-roofed dormer on the right side. The wide front gable is half-timbered with a bank of six windows. The centrally-located front steps lead to an offset and recessed corner entry on the right. It is balanced by a wide cantilevered box bay on the left. The house is clad in shingles, broken by string and belt courses of varying widths. All the windows are diamondpaned leaded lights above single panes, many in banks of four. The foundation is granite. The interior was furnished by one of Britain’s best A&C architect-designers, M.H. Baillie-Scott, with additional pieces from the top American A&C firm, Gustav Stickley’s Craftsman Homes. The house cost $7,000. 1904-06: Alexis Francis Ramsay Martin (b. Hamilton, ON 1871-1938), a “lauded cricketer” and a member of the well-known Victoria legal family (his brother was Archer Martin, 1022-24 McGregor Av, Rockland), was a lawyer and judge. Alexis came to Victoria in 1898; he was a bachelor when he built this house. In 1907 he married 23- year-old Hamilton-native Emilie Alice Innocent Mason. 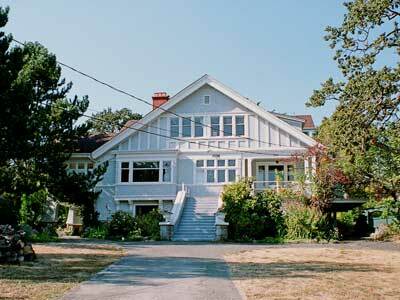 In 1910-11 they rented 1630 Rockland Av while their new house at 925 Foul Bay Rd, Oak Bay was completed. 1907-18: Richard P. Williams, a commercial traveller, who left Victoria by 1921. 1918-26: James Alexander Mitchell (1851-1926) had lived at 1617 Rockland Av from 1905-18. Living with him were his brother John E. Mitchell (1849-1921), a retired miner, niece Kate Ethelyn Adair (1881-1957), who married James Mavor in 1927, and housekeeper Margaret Tennent. 1928: Charles and Marion Thomas had lived in 1630 Rockland Av in 1917. 1929-55: Peter Lawrence Naismith (b. Pembroke, ON 1865-1955) and Anne Sarah (née McCormack, b. Fort William, ON 1865-1941) came to Victoria in 1927 when Peter retired after many years with the CPR’s Natural Resources Dept. They lived here until their deaths.